Down here in Texas the rainy and cool weather continues in sharp contrast to previous years when the sun shone and temperatures were summer-like. On the bright side, this kind of weather makes it easy to stay indoors and spend the time necessary to write these articles. However, there are nice days also, and we take full advantage of them. For example, on February 15, 2010, we got our first really good look at a Tropical Parula Warbler – an uncommon south Texas specialty. In this article I am going to go back to a family of birds that I have covered before – the flycatchers. (See article #30 for a detailed discussion on flycatchers). 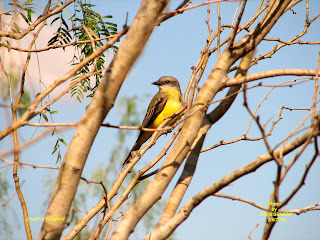 I will cover two closely related and extremely similar birds that are also south Texas specialties – the common Couch’s Kingbird and the uncommon Tropical Kingbird. In appearance both birds are very similar to the Western Kingbird that occurs in Saskatchewan. 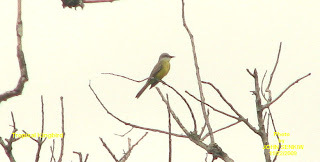 (In fact, a pair of Western Kingbirds nested and raised young in our back lane in Foam Lake in the 1980s). Essentially, all three species have dark brownish grey topsides and yellowish undersides. So, how does one tell the Couch’s and the Tropical apart when the two are so similar that, unless they vocalize, they cannot be safely separated in the field, and there is as much variation between individuals within the same species as there is between species? This is how. The Couch’s makes rather shrill sharp sounds typical of most flycatchers while the Tropical twitters. The calls are very distinctive and are used by birders in identification. I have included a photo of each species so that readers can appreciate the great similarity between the two. Even in full colour the birds cannot be distinguished from each other; in black and white there is absolutely no difference. 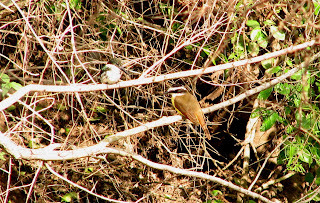 Both birds were positively identified in the field by their vocalizations by an expert birding guide from the area. After they were identified, I took the pictures. In other words, they are what I say they are. This is the 75th article in the series and I would like to remind readers of my website for these very same articles. The big advantage of following these articles on the website is that the pictures are in full colour and there are more of them. Moreover, I often edit the articles (usually in inclement weather) by adding or changing photos and by adding or changing text. It is free, so feel free to log on at any time. Enjoy. The weather here has been a little uncooperative as far as birding is concerned. The cool (not cold) wet weather along with some minor renovations to our newly purchased trailer has held our birding trips to a minimum. However, things are not as bad as all that. At this time of the year the birding scene is quiet anyway, plus I do have many pictures and experiences from previous years to work with. This week I want to deal with a family of birds that, with only a few exceptions, is essentially tropical – the parrots. In North America (excluding Mexico) there used to be two species of native parrots – the Carolina Parakeet of the south eastern US, and the Thick Billed Parrot of the Animas Mountains in south western New Mexico and the Chiricahua Mountains of south eastern Arizona. The Carolina Parakeet was literally shot into extinction because it liked to raid fruit orchards, peaches especially, and cause considerable damage. The last one died in captivity in 1914 which is the same year that the last Passenger Pigeon died, also in captivity. On the other hand, the Thick Billed Parrot was never numerous and, for reasons unknown, simply disappeared from its range at the end of the 1930s. Attempts to reintroduce it have failed. That being said, there are a number of species that have escaped captivity or were deliberately released and now have established breeding populations in the wild. An extreme example is the Monk Parakeet, a native of South America, that now lives and breeds from Florida north to Chicago and New York. There are quite a few others, but they are more localized in southern Florida, California, Arizona and Texas. Parrots come in a wide variety of different species. Some have crests, others do not; some have long tails, others have short tails, some are large, others are small, and so on. These different parrots also have different names to match none of which have any meaning in the scientific world (much like the names dove and pigeon). Some general examples are: large parrots with long tails – macaws, smaller parrots with long tails – parakeets, small parrots with long tails – budgerigars, large parrots with crests – cockatoos, small parrots with crests – cockatiels, larger parrots with short tails – parrots, smaller parrots with short tails – parroquets or love birds, and so on. 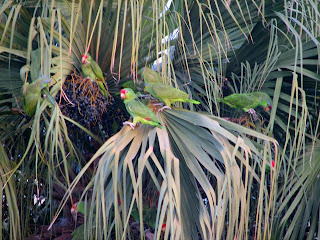 In this area there are four species of parrots, two of which are common and two uncommon. The latter includes the Yellow Headed Parrot and the Violet Crowned Parrot; the former includes the Green Parakeet and this week’s featured bird, the Red Crowned Parrot. It is a chicken sized green bird that sports a bright red forehead patch. Even though this week’s picture shows a solitary bird eating palm berries, it was part of a flock which is the nature of parrots in general. Red Crowned Parrots are feral (domesticated or captive livestock gone wild), but recently some ornithologists have decided that at least some of the Red Crowns are natives that have flown in from Mexico to join the feral ones. Because our trailer park consists almost entirely of “Winter Texans” (Canadians and northern Americans), there is a lot of excitement when a flock of parrots lands in the park. In flight, the very noisy birds sound like a flock of raspy squawking chickens; when perched and feeding, they are completely silent. Quite a contrast. In any case, people come out in droves to see them. I know that I certainly enjoy seeing them. We have had another week of unseasonably cold and wet weather. At times temperatures have dropped to a low of 4C and day time highs of 15C. Add to that the misty rainy weather and the result is that the furnace has been running. On the plus side, none of this seems to have affected the birds in any way. This week I am writing about another group of birds that I have never covered before – the kingfishers. There are many species of kingfishers scattered throughout the world, but probably the most widely known is the Kookaburra of Australia. It derives its fame from its loud call that resembles a hysterical laugh, hence the nickname of Laughing Jackass. Kingfishers are so named because of their feeding habits. The normal pattern has the bird sitting on a branch overlooking a body of water containing small fish. Fence, telephone and electrical lines are also utilized if water is present. Once a fish is spotted, the bird flies out directly over the fish, then, dives straight down head first catching the fish under water. Occasionally, a kingfisher will look for fish by flying low over the water rather than sitting on a branch waiting for the fish to come. In North America there are three species of kingfishers but only one, the Belted, is common all over the continent. It is the bird that was featured on the back of the former Canadian five dollar bill. The other two, the Ringed and Green, are common only in the southern tip of Texas. This week’s featured bird, the Green Kingfisher, can occasionally be found in southern Arizona also. All three dig out burrows in river banks or similar sites for nesting. 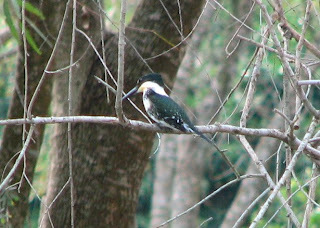 The Green Kingfisher is different from the other two on several counts. The females of the Belted and Ringed are more brightly coloured than the males, which is highly unusual in the world of birds. On the other hand, the male Green is more brightly coloured than the female. In flight, the Belted and Ringed are noisy making loud rattling calls while the Green is usually silent. Dimensionally, the Ringed is the largest approaching a chicken in size; the Belted is smaller being only a little larger than a robin; the Green is the smallest being sparrow sized with an oversized head and beak. Three years ago, we saw all three kingfishers at the same time from the same spot. This sort of “trifacta” is very unusual and we consider ourselves extremely lucky to have experienced it. Of the three kingfishers, I have photos of the Green only which explains why it is the featured bird and not one of the other two. The first photo shows a female in its natural pose looking for some minnows in the water below. The second photo shows a Green Kingfisher and Great Kiskadee fishing together as it were. (Refer to article 38 for an in depth discussion on the Great Kiskadee.) It is not often I can get a picture like this, so I just had to include it in this article.